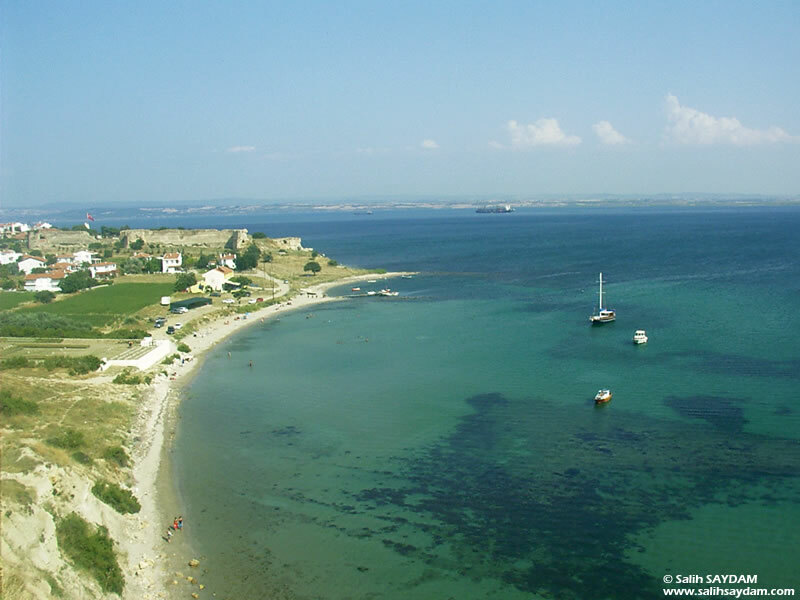 Eceabat, is situated on the Gallipoli peninsula, opposite the city of Canakkale. The total area is 490 square kilometers. Eceabat is on the highway linking Thrace to Izmir. Crossing the Dardanelles Strait is accomplished using ferries belonging the state ferry line, which run every hour between Canakkale and Eceabat. Eceabat came under the control of the Governor of Gelibolu till 1926, but after this date it has been connected to Canakkale. 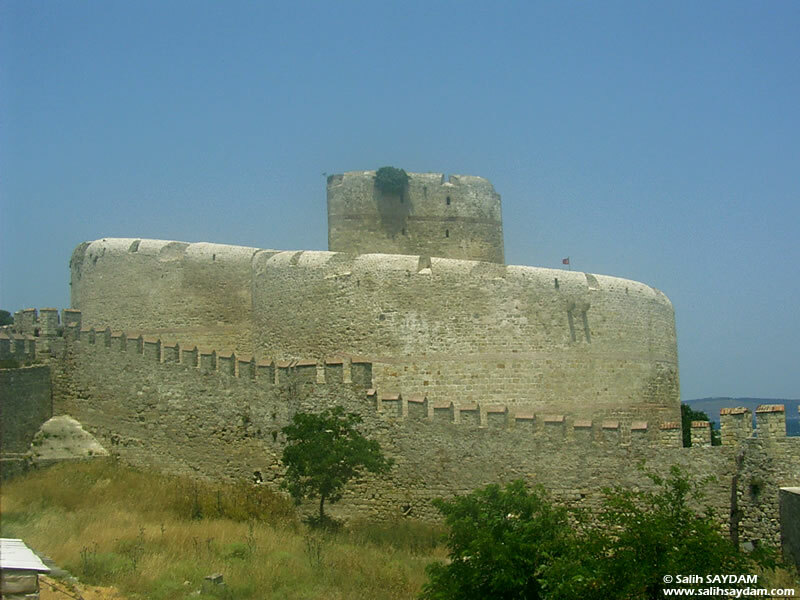 The castle of Kilitbahir was built in 1462 during the reign of Sultan Mehmet the Conqueror. The Sarikule (Yellow Castle), which is situated to the south of the main castle, was built in 1542, in the time of Sultan Süleyman the Magnificent. The first part of the castle resembles a three-leafed clover when looked at from above. The lenght of the walls is 221 meters and theirwidth is 1.2 meters. The inner castle is 30 meters hight, with the keep having seven storeys that are seperated by wodden floors, which still remain this day. There is an outer castle beyond the inner fortification. It consists of three parts and its walls are 18 meters high and 6 meters wide. 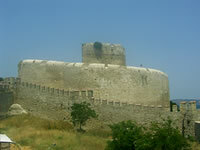 The walls surrounding the castle are 2 meters wide, 4 meters high and have a lenght of 510 meters. The walls of the Sarikule are 6.7 meters thick. There are seven positions for infantry within the building and eight artillery positions nearby. When you look at these positions it can be seen that they were built in such a way so as to cover both the land and sea approaches. There is a painted map of the Strait in the castle. 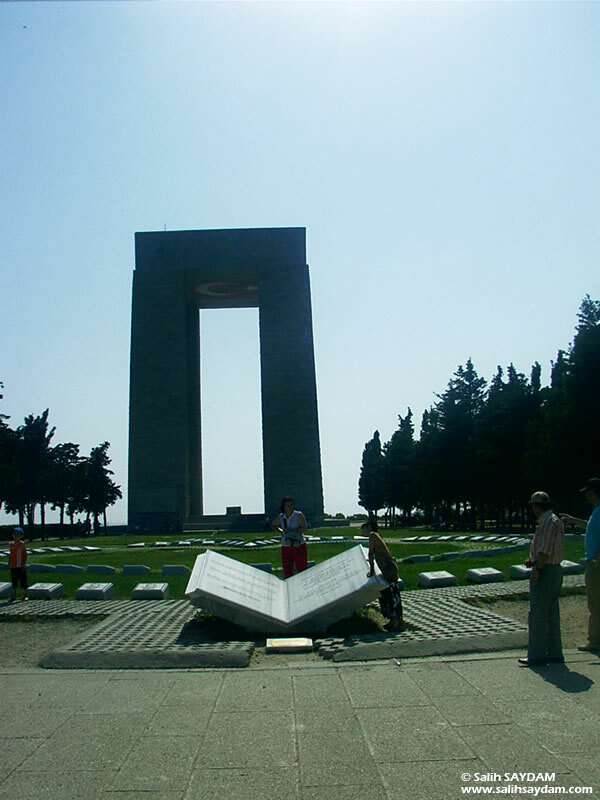 This monument has become the symbol of the Canakkale Wars for Turkey. Mustafa Kemal Ataturk said "The rights of the Canakkale heroes cannot paid even if a 40 meter high monument is built for them". 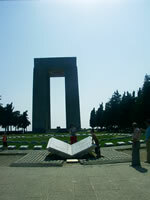 Ataturk's own height, 1.7 meters, added to this and thus the monument was built to a height of 41.70 meters. The space between the monument's four 7.5 meters wide columns is 10 meters and the monument is topped by a concrete slab. Construction of the monument began in 1954 and it was opened to the public in 1960. The museum beneath the monument was opened later and the bas-reliefs on the columns were completed afterwards. 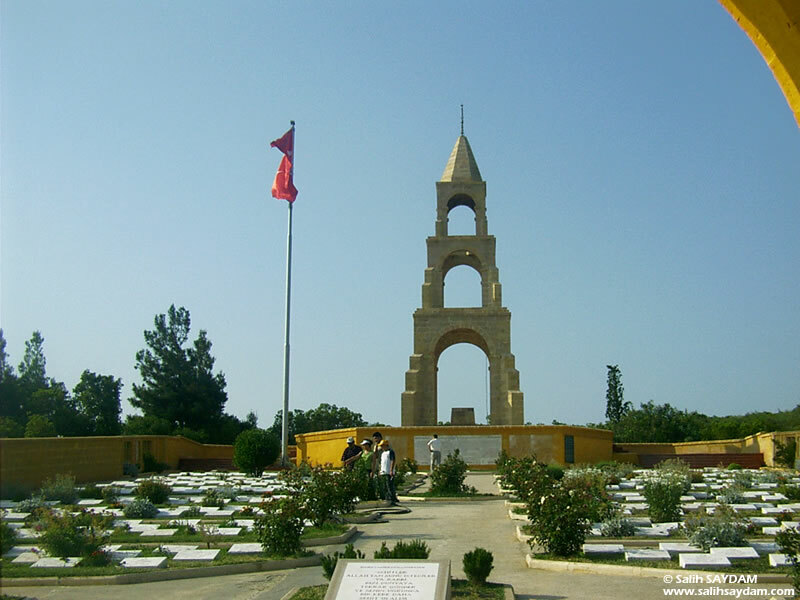 There is a cemetery to the north of the monument, with the graves of 600 Turkish soldiers, in memory of all those who died from all the regions of the country. The cemetery was opened in 1992. One of the soldiers commemorated in the cemetery was aged just 15 when he was killed. More than 4650 shells were fired by the Allied fleet in support of the three battalions of British troops trying to land at Ertugrul Bay (V Beach). Many of the Turkish soldiers defending the position were buried alive in their trenches. However, the 63 men of the 1st Platoon of the 10th Company of the 26th Regiment's 3rd Battalion, commanded by Sergeant Yahya of Ezine managed to halt the landing. For 10 hours they prevented the three British battalions from advencing. According to some sources, the sea was red for 50 meters from the shore stained by the blood of fallen British soldiers. Such was the weight of fire directed against them that some of the British troops thought they were opposed by at least a division of the Turkish army. Most of Sergeant Yahya's platoon were killed in action. When he became too badly wounded to fight, the sergeant withdrew with the few surviving men of his unit to the nearby field hospital at Alcitepe, where he later died of his wounds. All of the officers and men of the 57th Regiment, including its commander, were killed or wounded during the Gallipoli Campaign. As a mark of respect, there is no 57th Regiment in the modern Turkish army. The memorial was built by the Ministry of Culture and opened in 1992. There is a huge statue of a Turkish soldier on the left side of the road, above the nearby car park. The memorial is to the right of the road. There is a three-story tower at the upper and of the memorial, while at its entrance there is a statue of the last Turkish veteran of the campaign, who died in 1994. 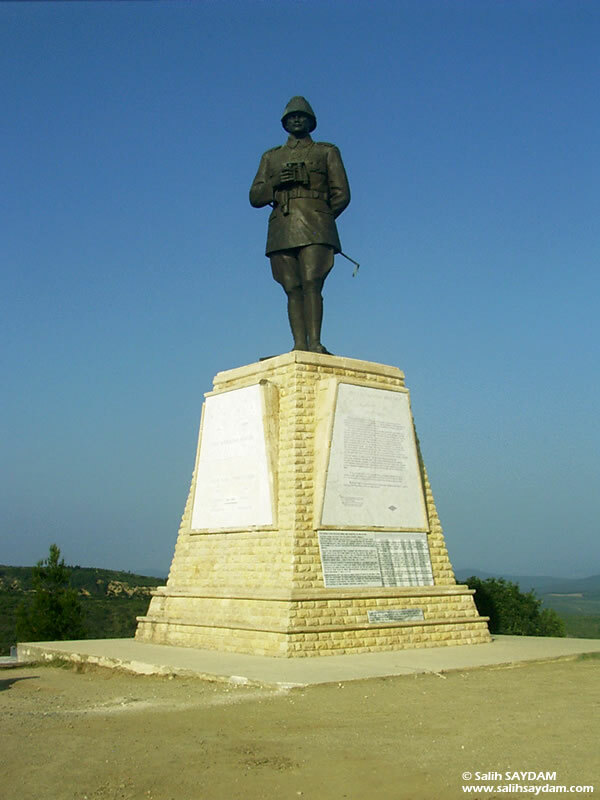 There is also a site reserved for muslim prayers to be performed and a relief inscribed with Mustafa Kemal's famous command: "I DON'T ORDER YOU TO FIGHT, I ORDER YOU TO DIE"
Conkbayiri was the most critical position in the Gallipoli Campaign. From this hill, also known as Hill 261, you can see the Aegean Sea, the Anafartalar Plain, Canakkale, the Dardanelles and most of the strategic points on the peninsula. It is also very close to Kocacimentepe, the highest point on the peninsula, which can be seen from Conkbayiri. Because of this, it was the objective of the attacks of the Australian and New Zealand Army Corp in both April and August. Mustafa Kemal was able to repel both these assaults against this strategic hill. Known to the Turks as Conkbayiri, to the Alies it became "Chunuk" later becoming "conk" in Turkish. 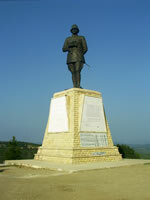 There is a large statue of Mustafa Kemal at Conkbayiri. At the base of this statue, there is a plaque detailing his ordering the attack of 10th August 1915 and how a shell fragment damaged his watch, which was in the pocket of his coat above his heart. His statue is located on the exact spot where his watch was damaged. Turning to the left there is a memorial to a Turkish officer, Nafiz Cakmak, who was the brother of field Marshall Fevzi Çakmak trenches and Mustafa Kemal's observation post. Behind Ataturk's statue, there is the main New Zealand Wellington Battalion had its forward trench when it captured an held Conkbayiri in the August battles. One hundred meters from these monuments, five large stone plaques which are inscribed with a history of the fighting in the Ariburnu sector. The five stones are designed to represent a hand reaching skywards. Following the road to the right of Conkbayiri, you reach the Epigraph of Kemal Yeri, stuated on the site where Mustafa Kemal had his field headquarters for the early part of the fighting at Ariburnu. Please remember that all the photographs are protected by copyright and may not be used for commercial purposes without the written permission of Salih SAYDAM. For use or publish the photos in any way you must receive written permission first and give me credit.